Posted in: 1 Pageant Pages, 2 Shout-out-Looks. Tagged: Albert Andrada, Malacanang Palace, Miss Universe 2015, Pia Alonzo Wurtzbach. This coming Monday, January 25, Miss Universe 2015 Pia Alonzo Wurtzbach will have both her courtesy call at Malacañang Palace with President Noynoy Aquino and the Grand Parade afterwards. 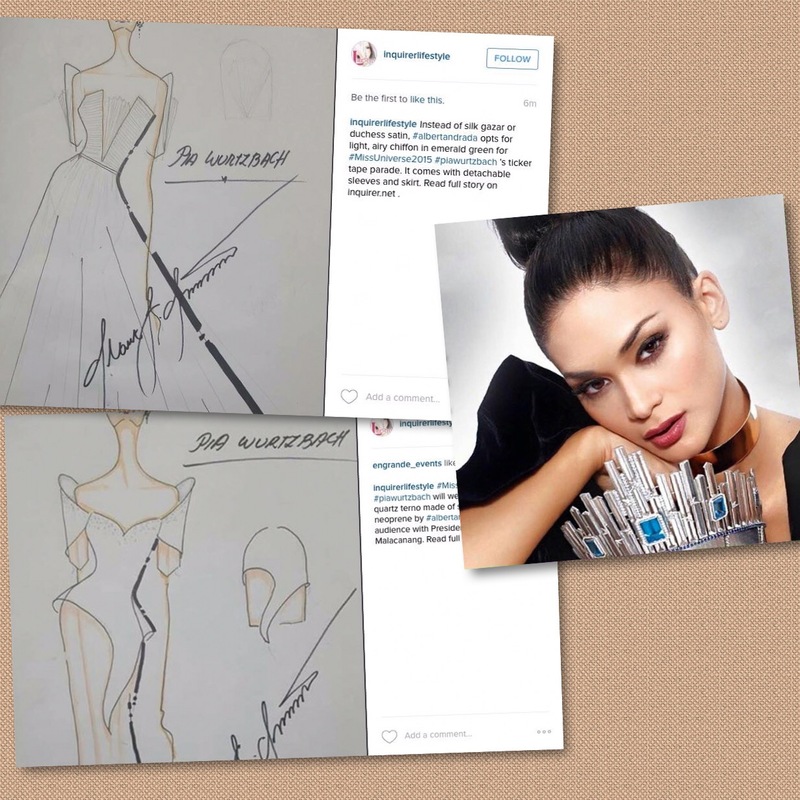 On both occasions, she will wear the creations of her favorite (and lucky) designer Albert Andrada who did the now famous Royal Blue gown en route to winning the crown during last month’s finals in Las Vegas. 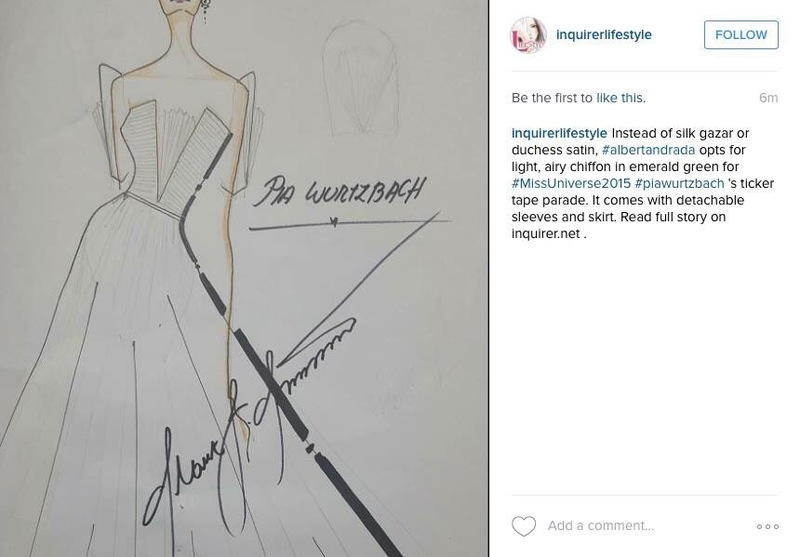 Take a closer look at the two sketches and descriptions below as uploaded by Inquirer.net. Posted in: 1 Pageant Pages, 2 Shout-out-Looks. Tagged: Albert Andrada, Las Vegas, Miss Universe 2015, Pia Wurtzbach. Miss Universe Philippines Pia Alonzo Wurtzbach has safely arrived in Las Vegas (photo above) and is ready to actually start with her important mission in Miss Universe 2015. 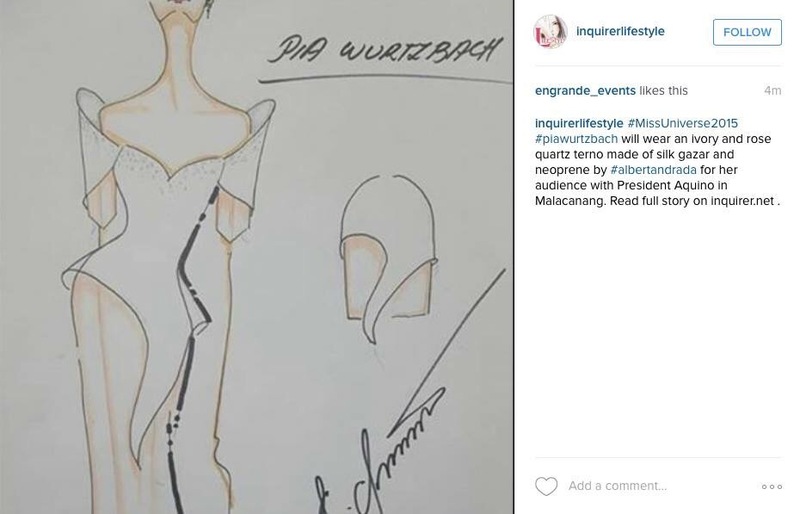 Ms. Philippines Pia Alonzo Wurtzbach will be wearing Albert Andrada in the Ms. Universe’s National Costume competition! Thank you for the trust Bb. Pilipinas and Mdm. 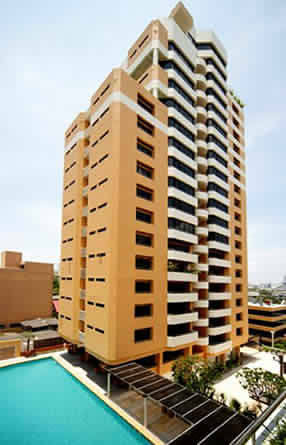 Stella Marquez Araneta. Posted in: 1 Pageant Pages, 2 Shout-out-Looks. Tagged: Albert Andrada, Arcel Pacaigue, Edviro Fuentes Jr., Edwin Uy, Fisher Mall, Kevin Dale Jovellano, Mark Andrew Baron, Mister United Continents Philippines 2015, Nere Ku, New World Hotel, Nikko Abdul, Olan Roque, Palladium, Rodell Salvador, Victorio Bote. 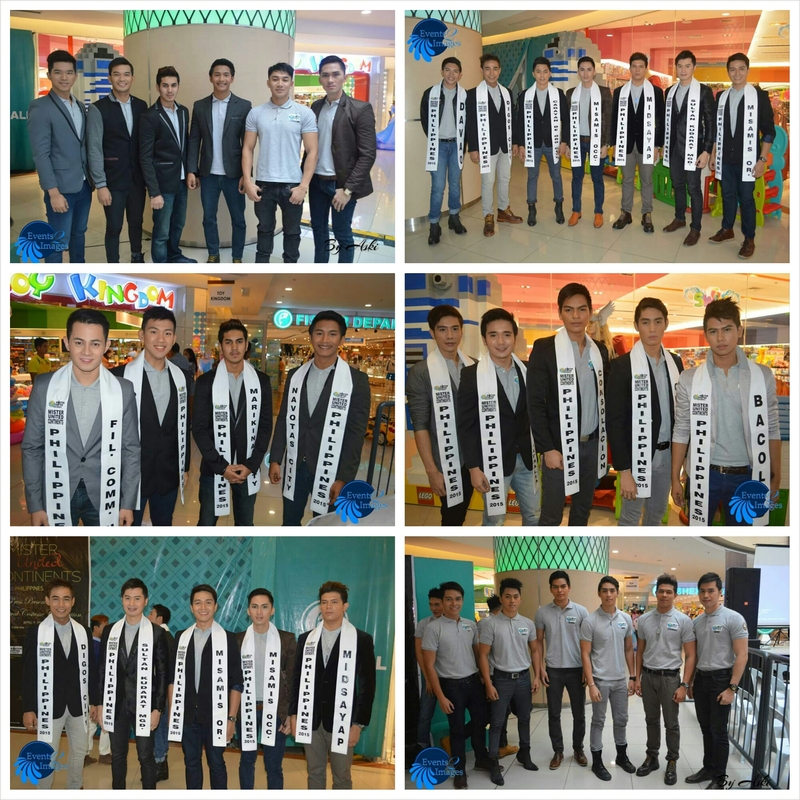 The twin set of activities for Mister United Continents Philippines 2015 was held yesterday inside Fisher Mall in Quezon City. The Press Presentation of the Official Candidates was conducted first, followed by the Regional/Festival Costume Competition which had all the contenders garbed in their home provinces’ most creative traditional wear. The Top 5 Finalists for this part were announced, and they are the entries of Laguna (Victorio Bote), Midsayap (Kevin Dale Jovellano), Tacloban (Edviro Fuentes Jr.), Sultan Kudarat (Nikko Abdul) and Marinduque (Arcel Pacaigue). The Darling of the Press was the first award to be handed out. Mr. Navotas City Mark Andrew Baron was named for this recognition. Here are photos from the said event. And wait. There’s another important activity to follow. Starting at 9pm tonight at the Palladium of New World Hotel in Makati, the ‘Strictly-by-Invitation’ Gala Night of the male competition will be underway. The candidates will be wearing the creations of some of our noted designers like Albert Andrada, Edwin Uy, Olan Roque, Nere Ku, Rodell Salvador and more. Bb. 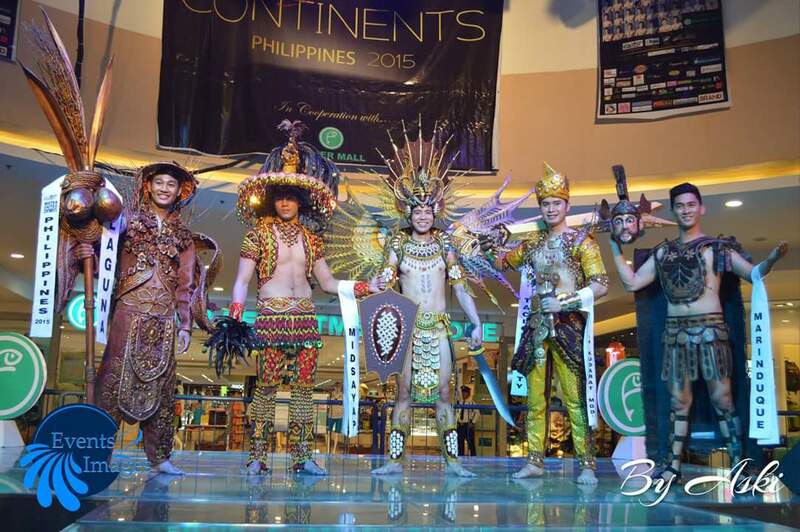 Pilipinas 2015 Best in National Costume by online voting? Posted in: 1 Pageant Pages, 2 Shout-out-Looks. Tagged: Albert Andrada, Bb. Pilipinas 2015, Edwin Uy, Ina Dominica Guerrero, John Cliff, Nancy Leonard, Philip Tampus, Pia Wurtzbach, Rogelie Catacutan, Teresita Ssen Marquez. The latest buzz is that the winner of Best in National Costume of Bb. Pilipinas 2015 will be decided upon by online voting. And this could only mean that whoever has the strongest fan base support – among Binibinis 10 Pia Wurtzbach, 25 Rogelie Catacutan, 27 Ina Guerrero, 29 Nancy Leonard and 34 Teresita Ssen Marquez – will eventually end up getting the special award come March 15. One of the designers of the Top 5, Edwin Uy in particular, has expressed his disagreement (see screenshot of his sentiments below) on the matter should it happen. 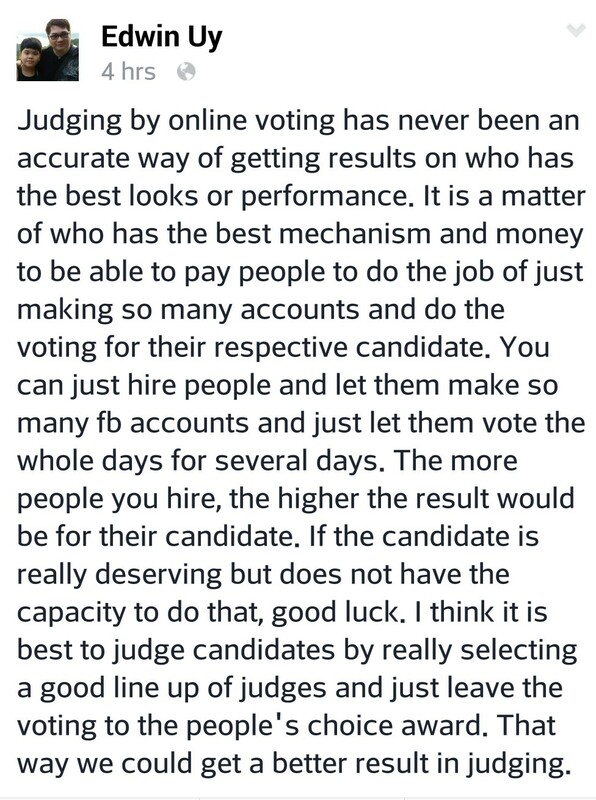 Can we really choose the best here via online voting? Posted in: 2 Shout-out-Looks. 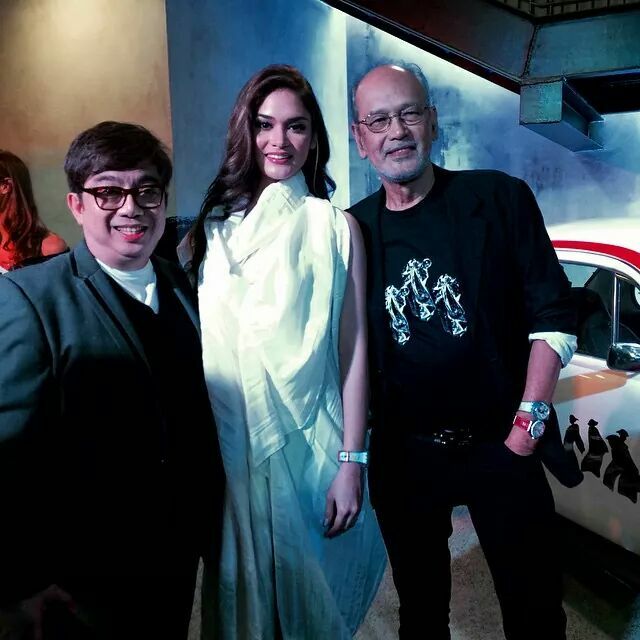 Tagged: Albert Andrada, BenCab, Pia Wurtzbach, Sabel, Swatch+Swatch Center. Last night was the launch of the Limited Edition BenCab Swatch “Sabel” Series at Swatch+Swatch Center on Arnaiz Avenue in Makati City. And guess who was the “Sabel” muse of National Artist BenCab? None other than the beautiful Pia Wurtzbach who was dressed in a “Sabel”-inspired attire designed by Albert Andrada. 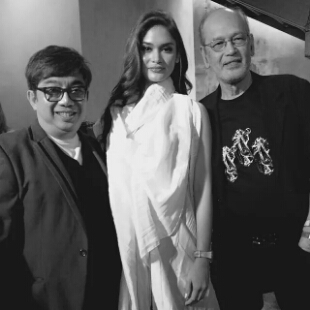 Pia was admittedly at her most ‘kilig‘ moment being chosen as the muse of the renowned BenCab, and she was equally honored to be wearing Albert’s design for the launch as well. Posted in: 1 Pageant Pages, 2 Shout-out-Looks. Tagged: Albert Andrada, Bb. 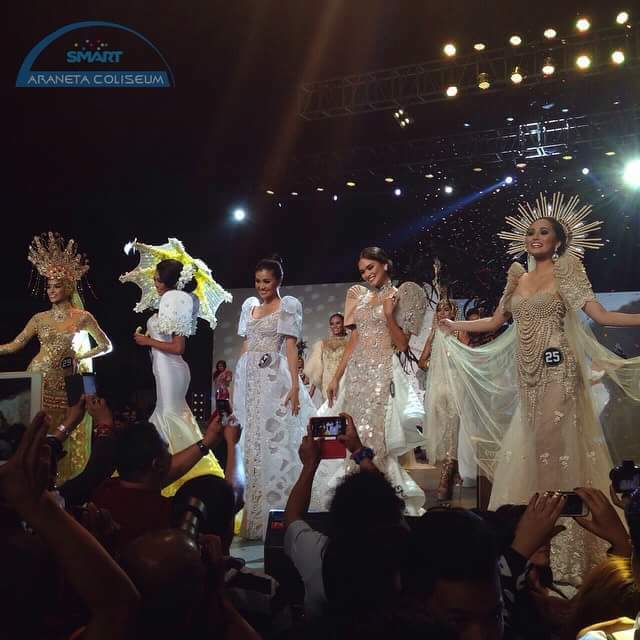 Pilipinas 2014, Julian Aurine Flores, Michael Cinco, Veejay Floresca. Julian (J): Hi Sir Norman! You want to feature me daw in your blog? My pleasure po! N: First question. And you need not answer too quickly. Does being a professional model give you the advantage of doing well in the competition? J: Yes, it’s an advantage po. As a model, I learned how to adapt to different kinds of people, to take in criticisms constructively and the value of patience. I was able to use all these important lessons in my Binibining Pilipinas experience. N: Good! Here’s my next question. Do you believe that good luck plays an important role in Bb. Pilipinas? Why or why not? J: Yes, I do believe that luck is a huge factor but I also believe that you create your own destiny. With perseverance and hard work, luck will be on your side. N: Okay. 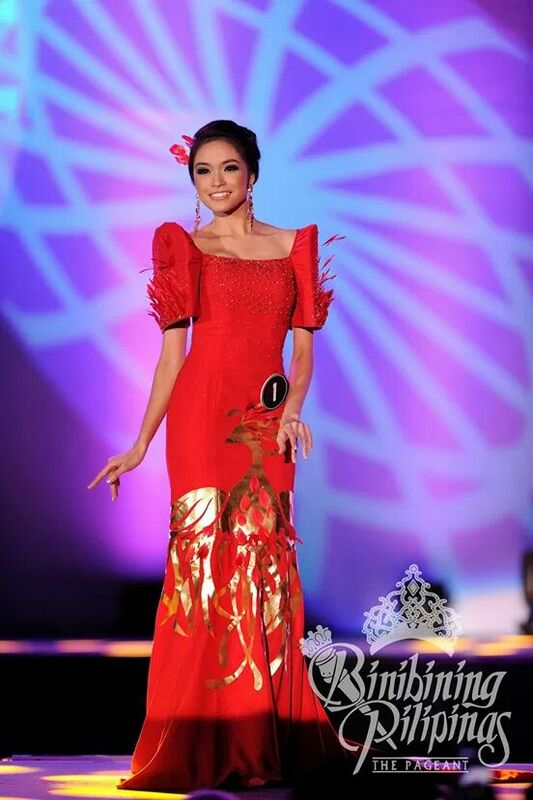 Question #3: what is the best pageant-related lesson Kagandahang Flores has taught you so far? J: I learned a lot from my Kagandahang Flores family. I learned that pageants are not just about the glitz and glamour, it’s more about trust and camaraderie. I will cherish these friendships I made for the rest of my life. N: I won’t ask you a lot. So here’s my last. 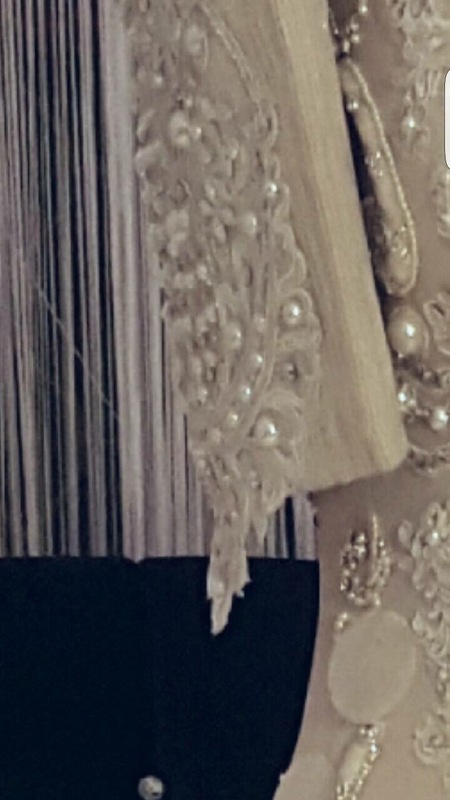 If you are given the chance to wear the gowns of your favorite fashion designer (local or foreign), who would that person be and why? J: Among my favorites is Albert Andrada. 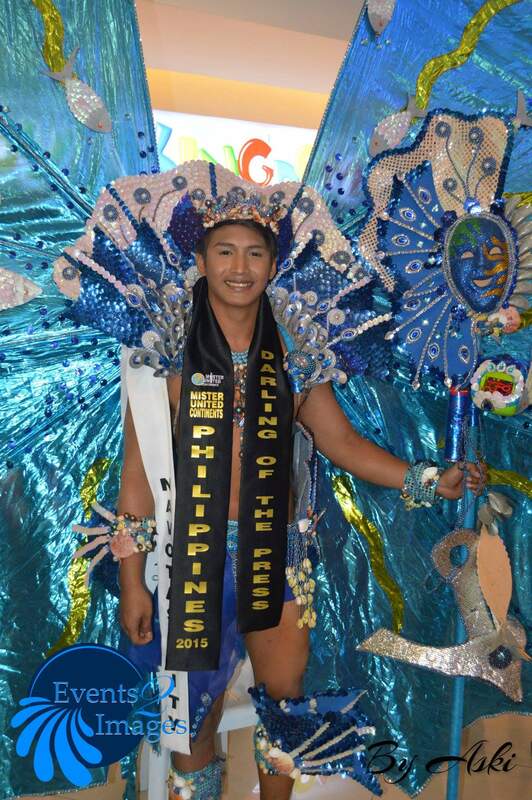 I feel so privileged to have worn his creation during the National Costume competition. 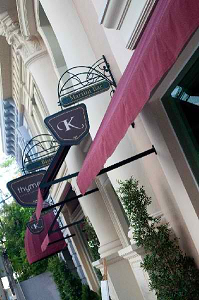 Another designer I’ve had the pleasure of working with is Veejay Floresca who is a fashion visionary. I also love to work with Michael Cinco someday. His creations are impeccable! N: Perfect! It’s getting late and I know you still have to attend to Bb. Pilipinas activities in the morning. 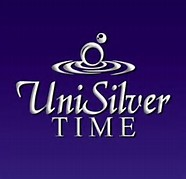 Thanks for the time! J: You’re welcome po. And thanks for the opportunity to be featured in your blog. N: Oh, you deserve the spotlight, Julian. Believe me. J: Aaawww. Thanks po uli. I’ve always loved this Binibini. Posted in: 2 Shout-out-Looks. 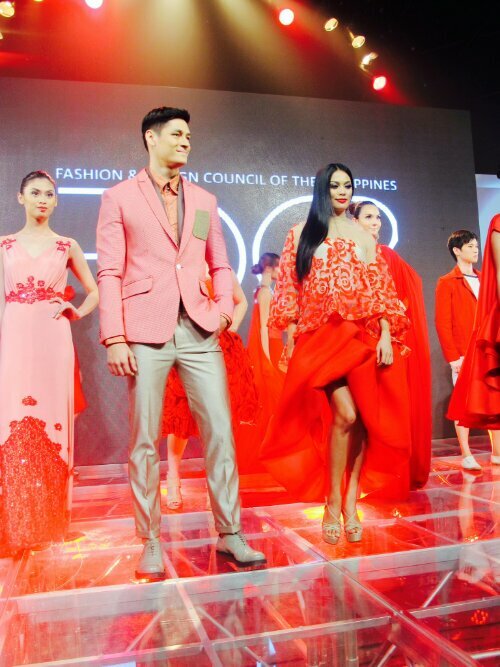 Tagged: Albert Andrada, Ariella Arida, Bea Rose Santiago, Fashion and Design Council of the Philippines, Pia Wurtzbach, Pilipino Para Sa Pilipino, Randy Ortiz. Ariella, Bea and Pia all participated in the charity fashion show. 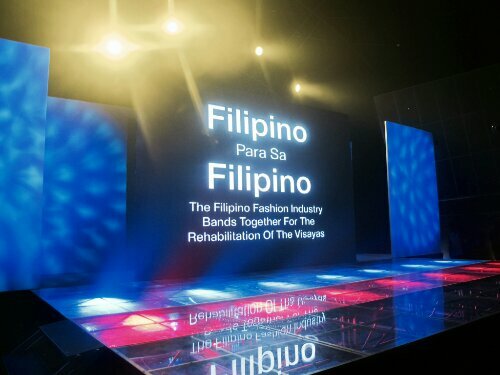 During the “Filipino Para Sa Filipino” fashion show organized by the Fashion and Design Council of the Philippines held recently, some of our Bb. Pilipinas Gold ladies walked the runway to help raise funds for the rehabilitation of the ST Yolanda-damaged provinces in the Visayas. Miss Universe Philippines and Miss Universe 2013 3rd Runner-Up Ariella Arida, Bb. Pilipinas International 2013 Bea Rose Santiago and Bb. Pilipinas 2013 1st Runner-Up Pia Wurtzbach were among those who shared their time for a good cause. They walked the runway wearing creations by known Filipino designers like Randy Ortiz and Albert Andrada, and provided a truly glowing presence to the whole event. Ariella (R) with Brazilian-Japanese model Hideo Muraoka.